Description View from North E.
Scope and Content Cast-iron panel on forestair of South Queensferry Tolbooth (front), City of Edinburgh South Queensferry Tolbooth dates from before 1635. An application for money for repairs was made to the Convention of Royal Burghs in 1649. The tolbooth was substantially rebuilt in 1720. 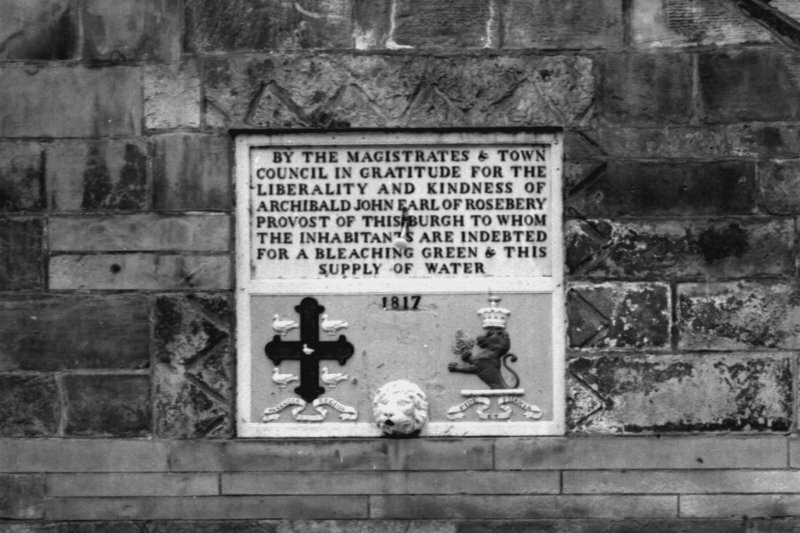 A plaque on the forestair records that in 1817 the 4th Earl of Rosebery, then the burgh provost, provided a water supply and a bleaching green for the inhabitants. Source: RCAHMS contribution to SCRAN.